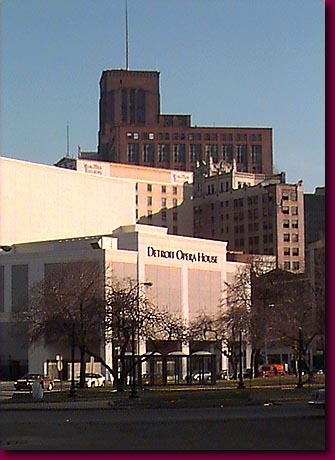 Home to the Michigan Opera, the Detroit Opera Theater reverses the trend that has turned the once prized Grand Circus Park theater district into an urban ghost town. Beneath the towers of the doomed and abandoned Hudson's and Metropolitan Buildings, the newly renovated Detroit Opera House gleams in the afternoon sun. Currently, the only new restoration on the once elegant Grand Circus Park, it holds forth the promise of what can be as well as a reminder of what was for this once famous theater district. The restoration used the former Capitol Theater as its base.